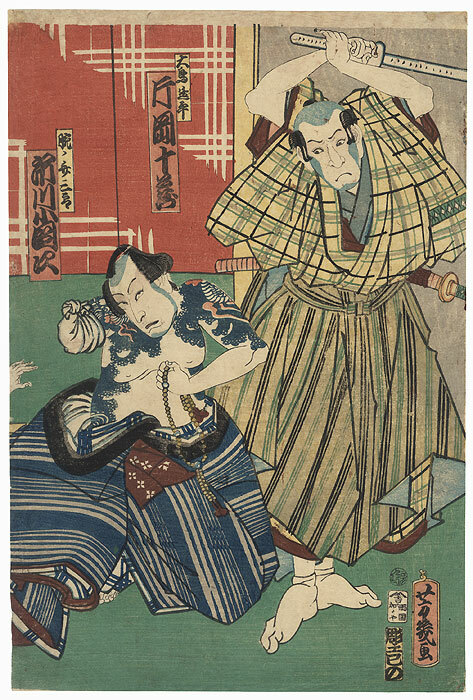 Comments - Unusual kabuki scene of a samurai threatening a tattooed man with one arm amputated. The samurai raises a wooden practice sword above his head with an angry scowl as the tattooed man stares up at him out of the corners of his eyes, a string of prayer beads in his hand. His upper body tattoo depicts a dragon with red blames. From left, the actors are Ichikawa Kodanji as Kisaburo and Kataoka Juzo as Otori Ippei. 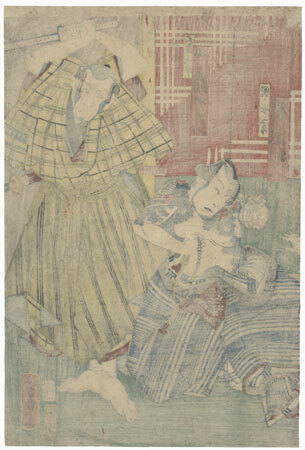 An intriguing subject and a rare depiction of an amputee in a kabuki print. Condition - This print with excellent color and detail as shown. Small losses at corners, a few holes repaired. Slight toning, soiling, and creasing, a few stains. Please see photos for details.